This 12,000-acre preserve, located at the historic headwaters of the Everglades, is home to hundreds of species of wildlife and one of the last undeveloped lakes in Central Florida. 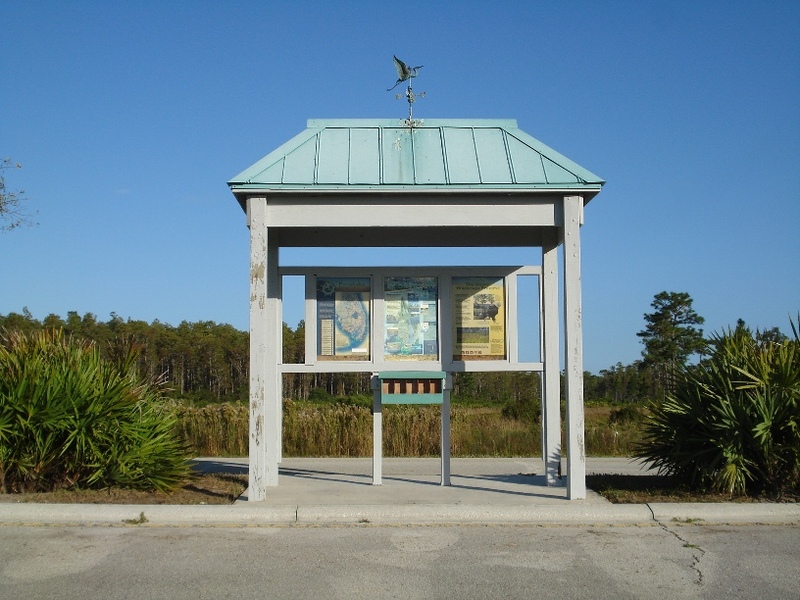 Interpretive exhibits and 2 1/4-mile hiking trail are available. 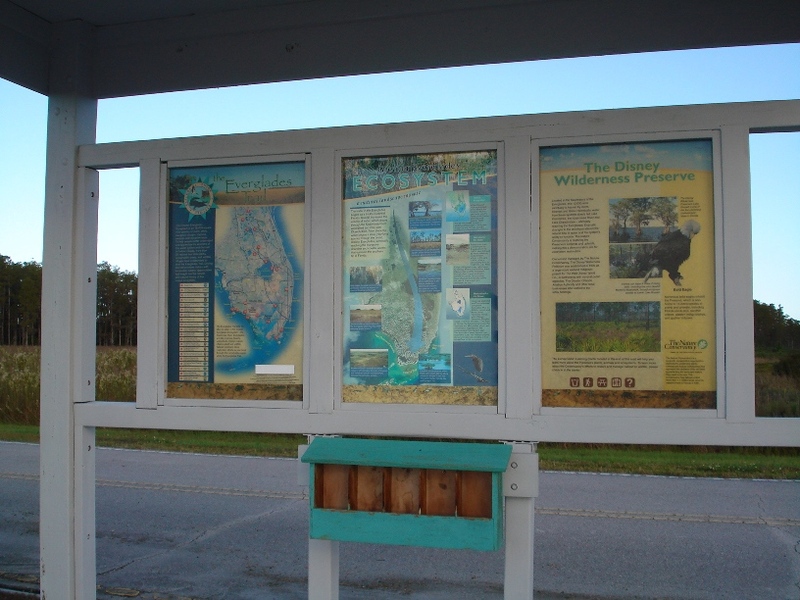 Above: Everglades Trail Kiosk #2. Looks like the birds are using the heron weather vane for a roost! I called and found out that the preserve is only open weekdays from 9 a.m. to 5 p.m., so plan ahead. I arrived early in the morning, and had to fight traffic on two-lane roads with people going to work or to school. Osceola County is quickly being developed without the infrastructure of proper roads, creating long lines at traffic lights. Development is encroaching all around, and houses can be seen in the distance beyond the cypress domes at the preserve. 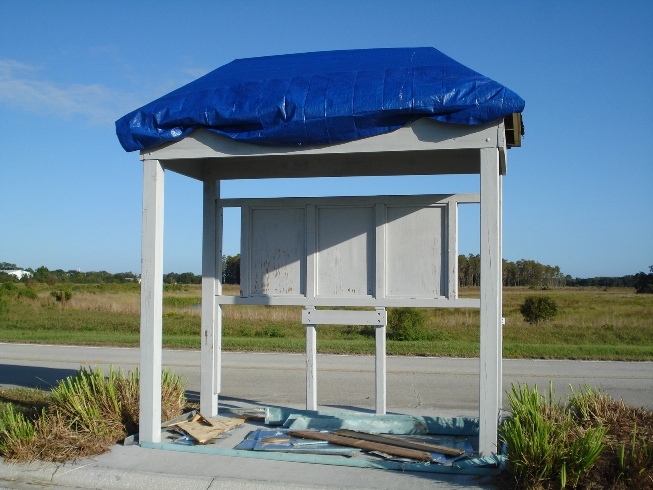 While coming into the preserve, the first thing I found was this kiosk under renovation. I wondered if I was too late? Fortunately, as I continued down the road, I found the real kiosk. I was worried that I had traveled all this way and it was gone! 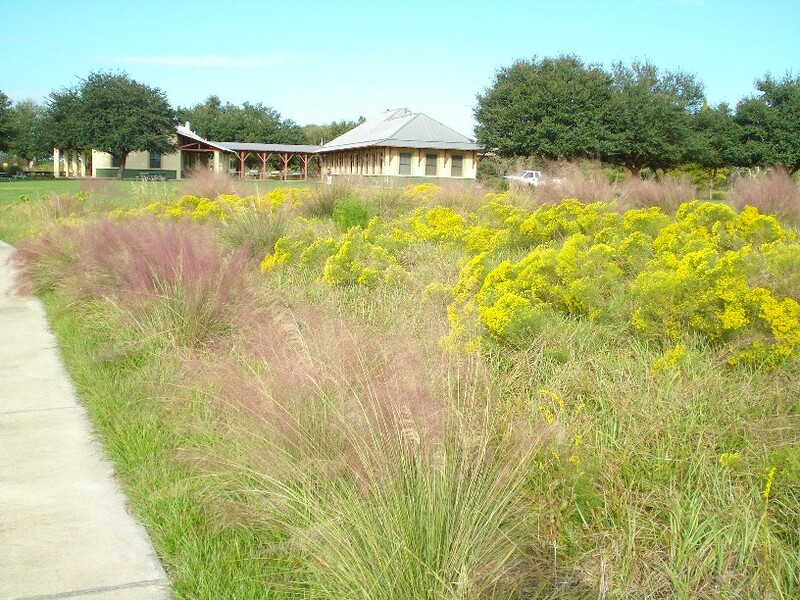 The office and education center are worth the visit at the preserve—it looks like old Florida cracker architecture, but is really energy efficient modern building. It shows that the old Florida settlers knew how to build to live comfortably. That's the building you see here in the background, in front of this magnificent display of blooming goldenrod and wire grass. 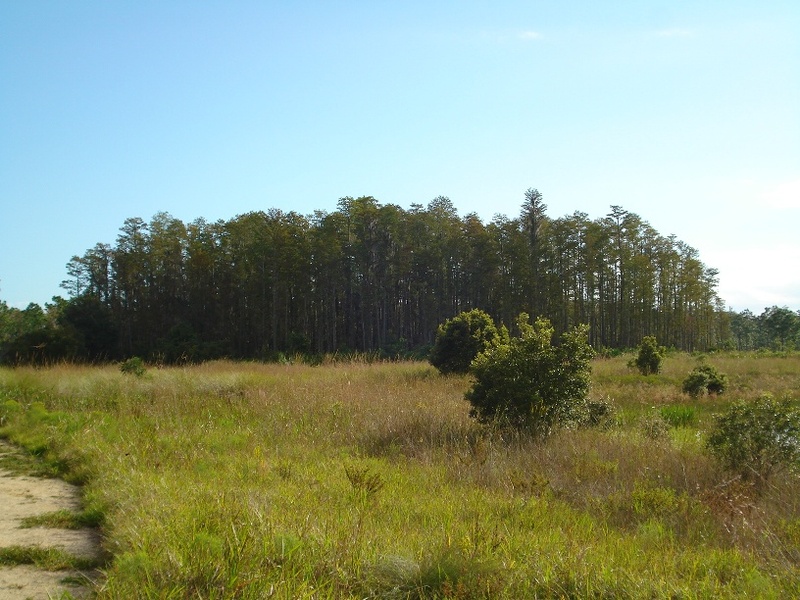 A cypress dome that is typical around Osceola County. 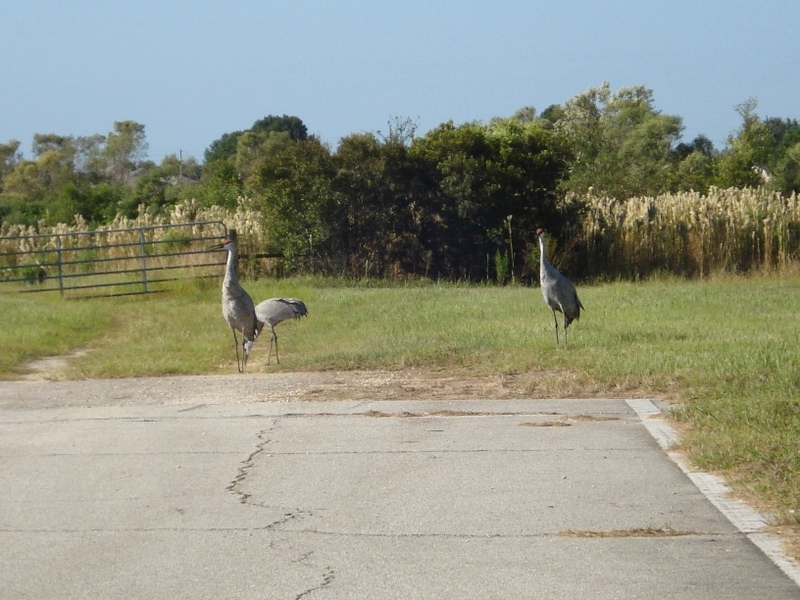 Often seen around here are the sandhill cranes. It is great that this park is preserved, but the houses, schools, and shopping centers are quickly surrounding it. The urban sprawl made it difficult to get to the preserve because of what I had to drive through to get there. This preserve is known as a mitigation park. Mitigation is predominantly a myth in Florida. When a developer wants to build something, they promise to set aside wilderness that will not be developed, or pay money so they can destroy a wilderness or wetlands area, and the money goes to preserve another place that developers have not touched. Or sometimes the mitigation money is used to reclaim an area such as a landfill and turn it into a park. In reality, mitigation is not saving anything, and wilderness & wetland areas are still destroyed by developers. 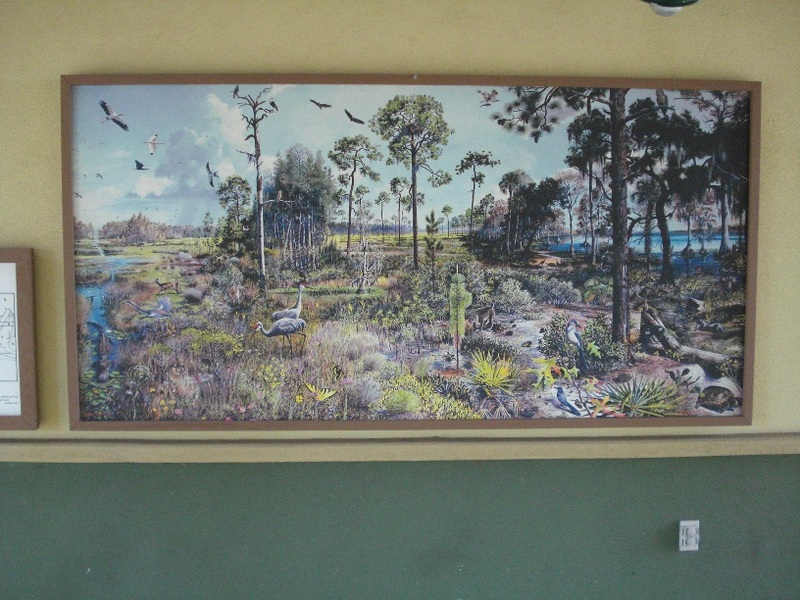 Mankind has not been able to successfully duplicate a wetland estuary or cypress swamp, and there are many examples of failure. Fortunately, this park is a rare example of mitigation that worked. 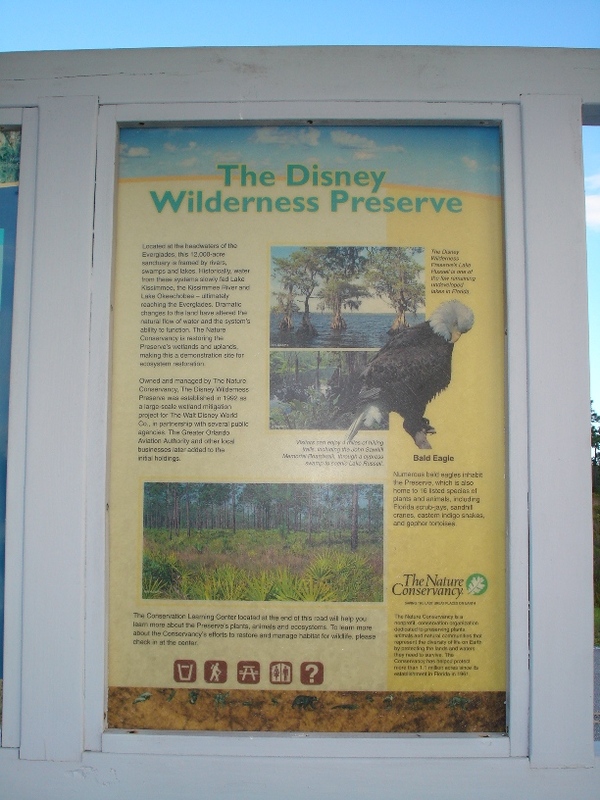 When Walt Disney World was being built, this area was set aside as a mitigation preserve. But I wonder what the future holds, with the houses that I see in the distance. Will this nice preserve eventually just become a nice park surrounded by suburbia?